As you play your favorite games, you may at times encounter some particularly challenging sections. Getting hints at such times is not a crime, and this is what CheatBook DataBase 2017 is designed to do. The versatile cheat codes tracker creates hints, cheats, tips and tricks for all types of popular games irrespective of their genres and platforms. 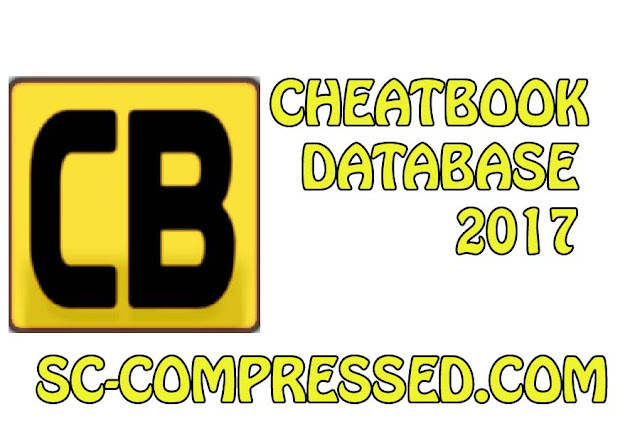 It is an encyclopedia of game cheats that provides all necessary assistance in a centralized location. The user interface was divided into various sections, with a menu bar and tabs for accessing different program features without opening multiple windows. We could access PC Cheats, PC Walkthroughs, Console Games, Search Engine, Own Base or Links via separate tabs. On the upper part of the Tabs were buttons for performing different actions, including adding a new cheat, editing an existing cheat, deleting cheats, using filters, accessing our favorite titles and getting relevant news. A search bar also allowed us to use keywords to quickly locate the titles that we wanted. When we selected a title, the lower part of the program window displayed its name, position in the list of titles and platform. The cheats, hints, tips, tricks and other details pertaining to the selected title appeared on the right side of the user interface. We could display the selected title alone instead of an entire list, in which case we got other details like cheat date, last update, last edit, note, file and picture. This latest release allowed us to store files and pictures. CheatBook DataBase 2017 is a handy program that provides extra weapons and other tools for overcoming even the most difficult parts of games. 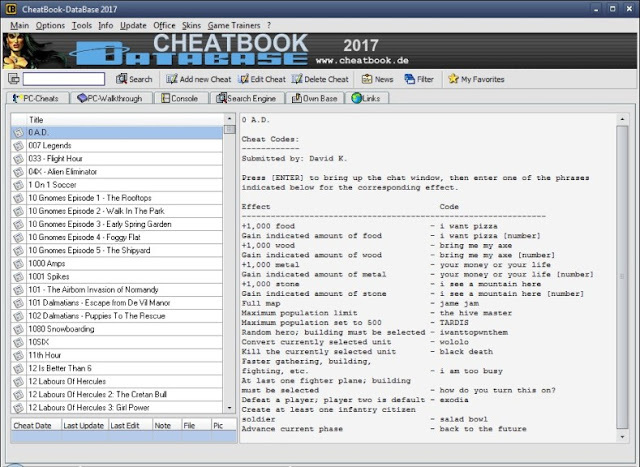 The cheat codes tracker is compatible with PC, Playstations, Nintendos, Sega, Xbox, Gameboys, Dreamcast and iPhones among others. You will get all games in all popular genres, with a special focus on the most recent releases. It features over 23,600 game cheats, and you can add cheats to the database. It is also easy to import old personal databases.